Gingerly following the mysterious, tawny bulk of Wrolf, himself behind the enormous-for-a-feline puff of Zachariah, Maria Merryweather entered the massive room of the house kitchen, previously to her, unexplored. Even at this point she dared not stray from the path the animals lead her, for the space was like a chapel and the glorious food smells, incense to heaven. In the center of the room, commanding his work space like a podium, if preaching be the deft work of his hands, was a small person clad in color and a zealous smile for the task at hand. Marmaduke from "The Secret of Moonacre" film. "Marmaduke Scarlet, at your service, young Mistress," he said in a crisp, squeaky voice, "Seat yourself, but do not articulate. 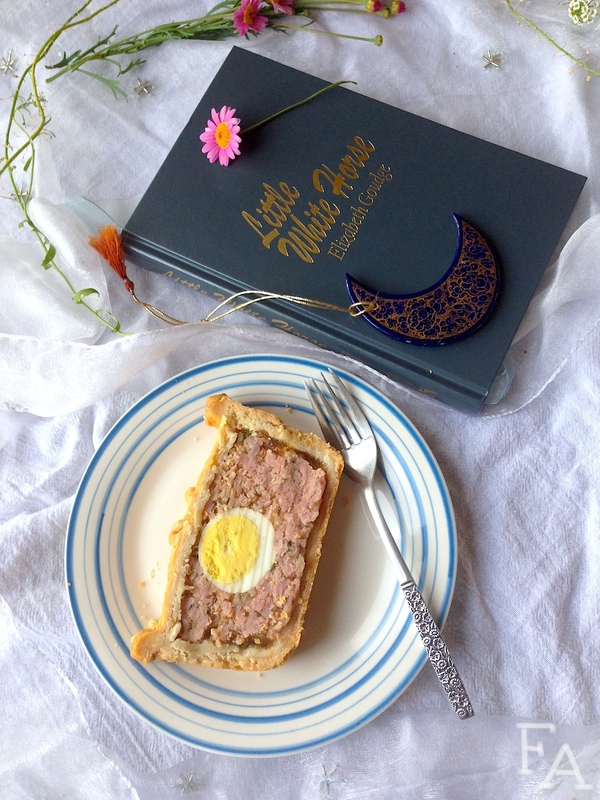 I cannot indulge in conversation while I am engaged in the creation of a veal pie." 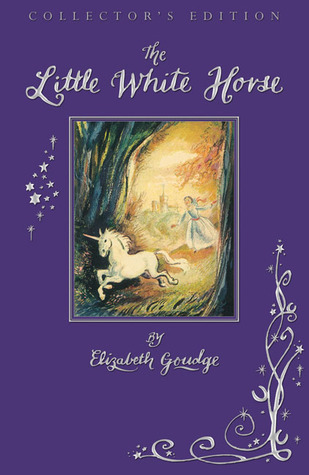 In Elizabeth Goudge's gilded fantasy novel The Little White Horse, 1st published in 1946 London and a great inspiration to many authors such as J. K. Rowling, the main character Maria encounters many delectable delights from the culinary master Marmaduke. Like, a scrumptious ton. I want to have it all. I chose Marmaduke's veal and ham pie though because the scene in which Maria watches him make it, is the scene in which she first meets him. 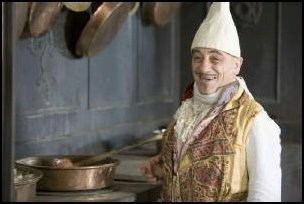 He wielded his rolling-pin like a king's sceptre, and so light was his pastry that it looked more like sea foam than dough as he flicked it over on his board. 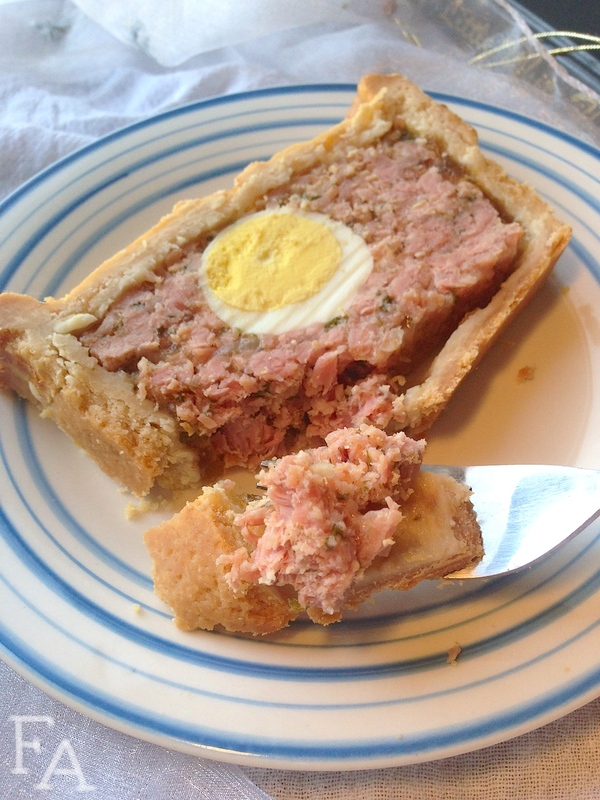 Beside him stood a great dish of succulent chunks of veal and ham, hard-boiled eggs, parsley and chopped onion. Maria's mouth watered as she looked at it, and when he swung the great oval of white pastry over it she had to swallow hard. Then he started to make the decorations for the top of it, his skillful fingers pinching out flowers and leaves from the dough with an artistry that any sculptor might have envied. 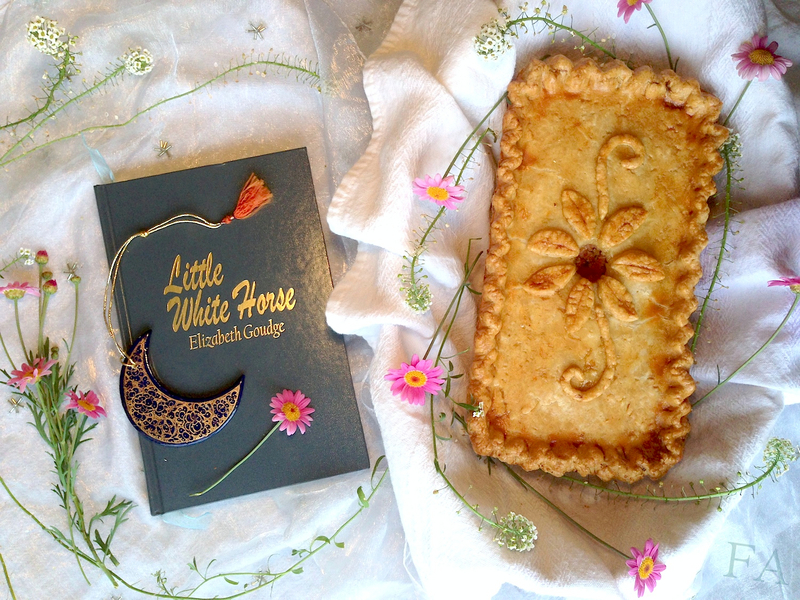 For my review of The Little White Horse click here. Note: It would seem that Marmaduke made an oval pie, and you can too, but in all honesty, because this type of pie is typically cut like a loaf of bread, a rectangle shape is more equitable for even slices. 1. In a medium bowl, thoroughly combine all of the filling ingredients by hand. Set aside. In a medium pot on high heat boil the 1st 3 pastry ingredients until the shortening & butter are melted. Remove form heat. In a heat-proof bowl whisk together the flour & salt. Pour in the heated shortening/butter liquid & stir until just combined & then knead by hands until fully combined (it'll be nice & warm). 2. Preheat your oven to 350°F. Grease your bread pan w/ shortening. Cut a piece of parchment paper to the width of the pan & long enough to hang a little over the sides & then place it into the pan (the shortening will hold it into place). 3. Roll out half of the warm dough into a long rectangle of about 1/4" thickness. Carefully place it into the paper-lined pan & press it up, & a little bit over, the sides. Next, scoop in about 1/3 of the meat filling & then line up the hardboiled eggs, end to end, down the center (on top) of the meat. Scoop in the rest of the meat mixture & gently press it around the sides & tops of the eggs, covering them completely. 4. Roll the rest of the dough into a 1/4" thick rectangle & then lay it on top of the filled pan. Cut off the excess & set it aside for decoration use. Nicely crimp & seal the top & sides together & then, using a small sharp knife, cut a nickel-sized hole out of the center of the top dough. 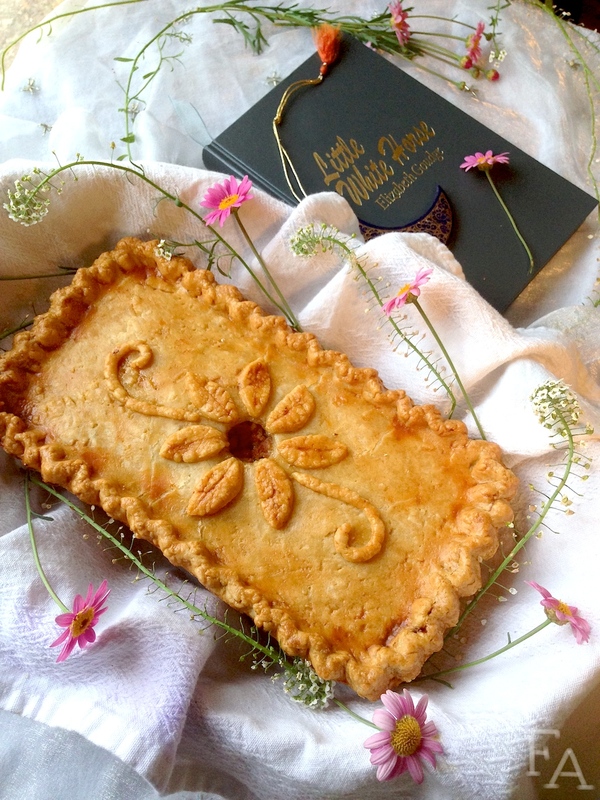 With the dough remnants, roll & cut little flowers & leaves & lay (gently press) on top for decoration (suggestion: place dough petals around the hole in the top of the pie). 5. In a small bowl vigorously whisk together the egg wash ingredients until no blobs remain & then lightly brush it all over the dough. Place into the oven & bake for about 90 mins or until the top is a nice deep, golden brown, laying foil over the top about 1/2 way through (45 mins.). Remove from oven when done. 6. In a small-medium pot, bring the stock to a boil (or you can simply zap it in the microwave for about 3 mins in a glass measuring cup). In a small bowl mix the gelatin powder & cold water until you get a thick, jiggly blob. Stir into the hot stock until the gelatin is dissolved. Using a funnel (it's okay if you don't have one though), carefully pour this mixture into the pie via the hole until the liquid reaches the top & then tap the pan on the counter to help the liquid fill in any gaps & crevices there might be inside the pie. Pour in more liquid as needed. Let the pie sit on the counter for about an hour & then put it into the fridge to chill several hours or overnight. Remove the pie from the pan by carefully sliding a butter knife all around under the edges to make sure it's not stuck to the pan (shouldn't be though because you greased the pan in step 3) & then pulling up on the overhanging parchment paper to lift the pie out of the pan. Place on a serving platter or cutting board & cut into 1" or so wide slices (crust will be rather on the hard side so saw & persevere!). Serve chilled as is, or heat it up a little, though heating much will cause the gelatin to melt. The slices are wonderful wrapped up for picnics or for work or school lunches.